The father of Sergio Agüero revealed that his son had offered to buy five new players for his former side Independiente, but no one at the Argentina club got back to him. 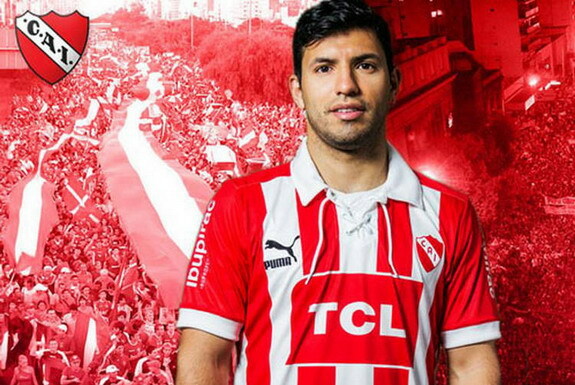 Agüero was on Independiente books from the age of nine and became the youngest player in the history of Argentine top-flight football when he debuted for them at 15. He scored 23 goals in 54 games for the Diablos Rojos before leaving for Atlético Madrid for €23 million in 2006, and moved on to Manchester City five years later, where he is one of the top earners at the Premier League's richest club. Meanwhile, Independiente have been on the ropes since last season, having been relegated from the the Argentine Primera División for the first time in their 108-year history. "Sergio offered to buy five players and pay their salaries," Agüero Snr told Argentinian radio Solo Rojo. "We asked (assistant coach to Miguel Ángel Brindisi) Carlos Squeo for a list of players, but we don't know what players they want because no one called back. Not Squeo, not Brindisi. "There's no leadership. I feel there is a slight against Sergio."